Restricted to a tiny, arid swath of African desert, Welwitschia mirabilis represents the last remaining species of a very unusual lineage of plants. Close relatives met with extinction over the aeons, while welwitschia, tucked away in its remote and harsh desert range with little competition, just kept going. The fact that the species is alone, not just in its genus, but also in its family and order (the two ranks above genus in plant systematics), speaks to just how distantly related to any other living plant it is. For the sake of comparison, the Rosales, the order to which roses, apples, and pears belong, contains around 7700 species in 9 families and 260 genera. So original and captivating is welwitschia among plants that it has been the subject of more than 250 scientific articles since it was first described in 1863. A mere infant. But probably still older than you are. So what makes this thing so weird? Well, plants typically have what’s called an apical meristem at the tips of their stems and/or branches. You can think of this as a clump of stem cells that keeps dividing, throwing off new leaves and buds in its wake. If you cut off the apical meristem, the plant must either develop a new one elsewhere, or stop producing new tissue. In welwitschia, this isn’t the case. At the beginning of the plant’s life, the apical meristem produces just two leaves, and then dies. The plant will never grow another leaf, which is much more surprising when you consider that it may well live for more than a thousand years. How do you get through a millennium with only two leaves?! The answer is, these aren’t ordinary leaves. 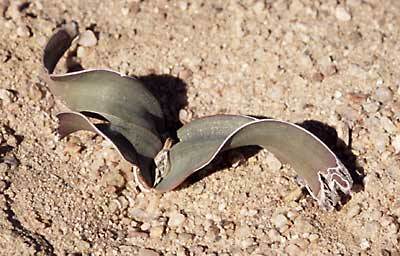 Uniquely, welwitschia’s two strap-like leaves have a band of meristematic tissue built into their base, which means they can continue to elongate outward indefinitely. The leaves will continue to grow at a rate of around half a millimetre (0.02”) per day for as long as the plant lives. If you’re thinking that this must mean leaves that are several hundred metres long, unfortunately, no, they aren’t. The leaves are abraded away by sand storms and eaten by passing animals. Even in the best case scenario, the cells at the leaf tips have a maximum lifetime of about ten years (still pretty good for a leaf…). What’s more, the leaves tend to get frayed and split over time, and end up looking like a lot more than just two leaves. 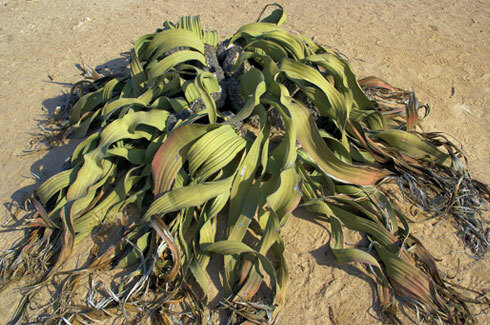 Despite all the punishment, though, each leaf can reach a length of up to four metres (13’), giving a mature welwitschia a width of up to eight metres (26’) across. Welwitschia’s answer to the pinecone. As you might expect from a long-lived relic of the past, there aren’t a lot of these plants around. For once, this has less to do with human disturbance than natural circumstances. Over millions of years, the range where welwitschia grows has dried out considerably, and in fact continues to get drier even now. Today, the plant relies largely on fog to meet its water needs, restricting its range to a thin strip of desert coastline where fogs occur regularly. 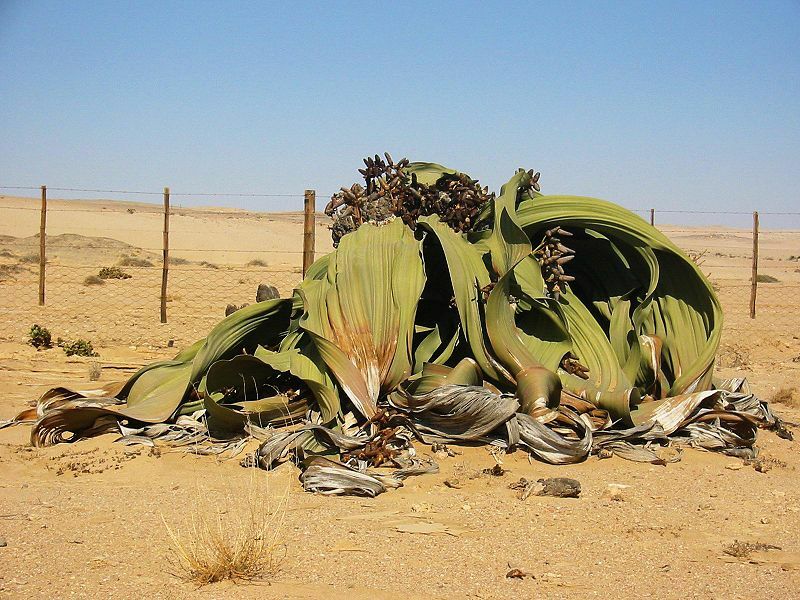 Unlike cactuses or succulents, welwitschia has never evolved the ability to store water. Also problematic is a fungus, Aspergillus niger, which frequently infects and destroys germinating seeds. 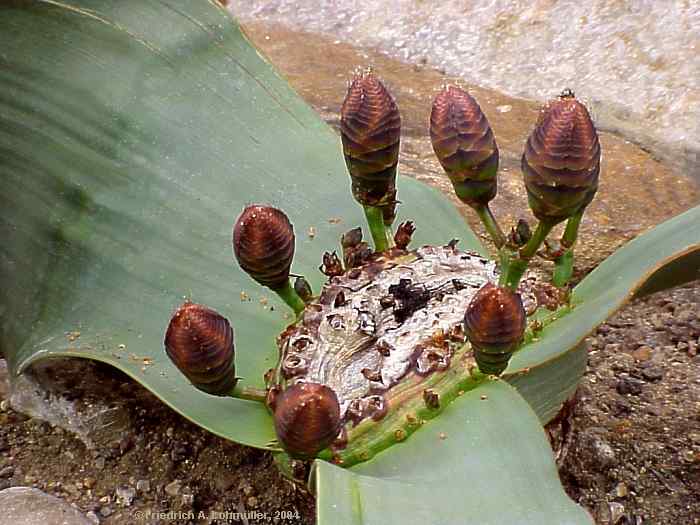 These factors together can mean that a welwitschia colony can sometimes go many years without successfully reproducing. And of course, no threatened species would be complete without some human interference. In recent decades, unscrupulous collectors have removed plants from already small breeding populations, making it even more difficult to sustain their numbers. 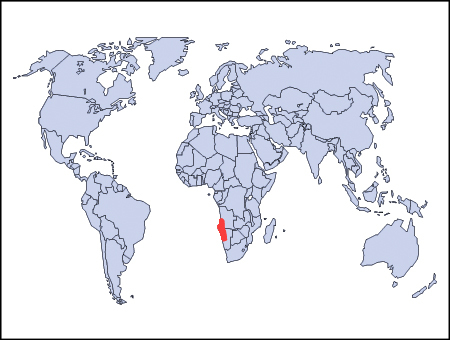 Interestingly, it’s noted in Wikipedia that plants in Angola are actually better protected from collecting than those in Namibia due to the higher concentration of landmines there. So… landmines: bad for humans, good for endangered plants. You think you have problems with split ends?